Land Destroyer: Syria: America's Democratic Terrorists? Al Qaeda seeks "consultations" to rule newly seized city. 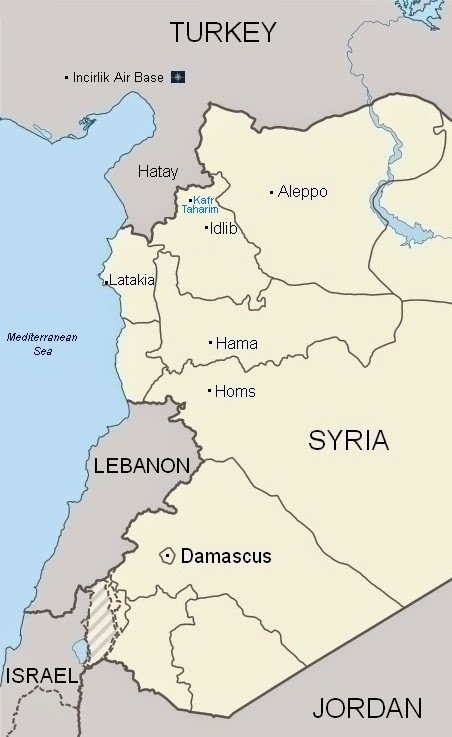 April 10, 2015 (Tony Cartalucci - NEO) - Making headlines recently has been Al Qaeda's temporary seizure of the city of Idlib, in Idlib province, northern Syria. The embattled city lies just miles from NATO-member Turkey's borders. With the Syrian Arab Army controlling the south of Idlib, it is clear that militants based in and supplied via Turkey took part in the operation, leading the Syrian government itself to accuse the NATO member of directly supporting Al Qaeda. A Syrian military source accused Turkey on Monday of helping Islamist rebels to stage an assault on Idlib, a provincial capital which fighters seized at the weekend. 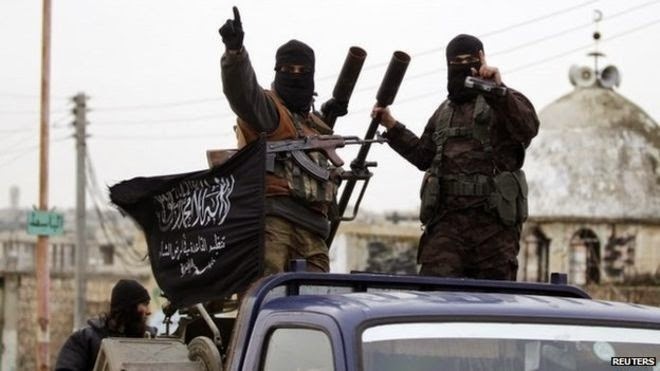 The source declined to comment on the situation in Idlib, citing security considerations, but a monitoring group has confirmed the al Qaeda-linked Nusra Front and allies now control Idlib and said the Syrian air force bombed the city on Monday. For years, prominent Western papers, including the New York Times in their report, "C.I.A. Said to Aid in Steering Arms to Syrian Opposition," have admitted that Turkey (as well as Jordan to the south) has harbored militants throughout the duration of the conflict, and has even hosted the CIA and other foreign intelligence agencies as they armed, trained, and coordinated with militants bound for Syria. It is a coincidence, we are expected to believe, that now Al Qaeda's Syrian franchise, Jabhat al Nusra just so happens to be strongest in regions bordering Turkey, and its Arab accomplice, Jordan. Further implicating Western support behind the recent Al Qaeda offensive, comes not from the Syrian government, but from the Wall Street Journal, who has claimed, with the terrorists not even holding the city for a week, that they are already well underway to "governing" it. The rebel groups that took over a provincial capital in northwest Syria over the weekend are now trying to consolidate control and establish civil governance. After days spent tearing down the ubiquitous images of Syrian President Bashar al-Assad, the coalition of Islamist groups, which includes al Qaeda’s Nusra Front, say they will help form a civilian government to run Idlib, capital of Idlib province. For now the streets are full of armed fighters with little organizational direction. Turkey's media demanded the seized city be used as a seat to host an "interim" government, a scenario hatched by US policymakers years ago in a bid to replicate Western success in dividing, then destroying the North African nation of Libya. Originally it appeared that Aleppo would be the targeted "capital" of the West's proxy regime, but the window appears to have closed on that opportunity. By hosting the interim government in Idlib, NATO could be "invited" to provide protection via a "no-fly-zone," effectively and permanently dividing Syria, and eventually leading to the overthrowing of the nation entirely. The opposition has a lot to prove in terms of governance as much of the territory it controls is beset by crime, corruption and a lack of services—in addition to regular attacks by the Syrian regime. The political opposition in exile, the Syrian National Coalition, has provided funding for local councils but the money has often been scarce and unreliable. The Journal is apparently using the terms "opposition" and Al Qaeda interchangeably, while also lumping the exiled "Syrian National Coalition" in with the notorious terrorist franchise - a US State Department-listed foreign terrorist organization. The Journal is also admitting that the Coalition is funding Al Qaeda to run "local councils." The narrative, repeated across the Western media, is that Idlib has been irreversibly seized by the "opposition," and destined to become the capital of Syria's alleged "opposition." Only a handful of Western sources include Al Qaeda in their headlines regarding Idlib. Many headlines are referring to Jabhat al Nusra, a US State Department-listed terrorist organization, as the "Syrian opposition," or a "Jihadi" or "Islamist" coalition. It is clear that the West is attempting to spin the fall of an entire city to Al Qaeda as a victory, rather than a threat to global peace and stability. Talk from the terrorists themselves attempts to portray a softer image, asking for "consultation" regarding the administration of the city. This comes in the wake of other recent calls by US ally, and host of the US Combat Air Operations Center for the Middle East, Qatar, who openly admitted it was supporting Al Qaeda in Syria, and sought to back it further with the precondition al Nusra scaled back its extremist rhetoric (note: not scale back its actual extremism). Leaders of Syria's Nusra Front are considering cutting their links with al Qaeda to form a new entity backed by some Gulf states trying to topple President Bashar al-Assad, sources said. Sources within and close to Nusra said that Qatar, which enjoys good relations with the group, is encouraging the group to go ahead with the move, which would give Nusra a boost in funding. Reuters admits inadvertently that al Nusra is already enjoying Qatari support. It is clear that al Nusra has not "severed ties to Al Qaeda" because it is Al Qaeda. What is forming before the world's collective eyes is an attempt to sell the concept of an Al Qaeda-led opposition government, based in Idlib, behind which NATO and its Persian Gulf allies will place their support. While this scenario seems "implausible," it should be mentioned that from the beginning of the fighting in Libya in 2011, it was pointed out by many geopolitical analysts that the so-called "freedom fighters" were in fact literally Al Qaeda, with NATO providing it with air cover, weapons, cash, and diplomatic support. In Libya, operational momentum outpaced the public's awareness regarding the true nature of the opposition. In Syria, the West is desperately trying to reshape the public's awareness that the opposition is in fact Al Qaeda - before a NATO buffer zone can be created around Idlib.